Dubbed Rabbitiq, the platform also provides a round the clock veterinary support and connecting the farmer to ready markets. “This service is helping me address my major challenge of trying to give personalised attention to rabbits. I got into this commercially so it meant I wanted to make the most out of it. But I couldn’t keep up with managing all of them. Paper work was so cumbersome, and I could see I was losing a lot,” said Derrick Muturi. A farmer registers his rabbits’ details online at www.rabbitiq.com, and key in all details of each of their rabbit including location of the farm, age of the rabbit, breed, when the rabbits will deliver, if they are expectant and when they are due for sale. Upon registration, the platform generates a unique code for each rabbit which the farmer then inserts as an ear tag to each rabbit. This then generates updates and alert to the farmer through the SMS. Already Muturi has registered other 24 farmers spanning Nairobi, Busia, Mombasa and Nyeri who are also using the platform. Rabbitiq is also addressing a major concern for rabbit farmers, that of effectively managing rabbit diseases which are contagious and spread fast due to rearing of the rabbits in close proximity to each other. “When farmers key in the details of the rabbit, they create a profile of the rabbit meaning important practices like when the rabbit should be dewormed or when a veterinarian is needed are not skipped,” Muturi said. According to the Ministry of Agriculture currently there are 600,000 rabbits being reared in the country, majority for commercial purposes, a departure from tradition where rabbit rearing was treated as a hobby for teenage boys. It's rearing has become particularly key in the recent past, as vagaries in weather takes a toll on traditional animal rearing and crop production. The rabbits also occupy little space compared to other animals and their manure is superior in nourishing crops compared to manure from other animals. “Demand for the rabbit meat and fur is global and companies are pitching tent in the country to encourage farmers and offering them a ready market. The catch therefore is effective management of each rabbit,” said Muturi. Manual chichen feed mixing machine. Photo: Zablon Oyugi. Smallholder farmers can cut the cost of buying feeds by up to 50 per cent using a manual feed mixing machine which is safe and cost effective. This comes at a time when farmers in the country are lamenting of high cost of poultry production. Currently a kilogram of maize germ which is a key ingredient in poultry feed retails at between Sh20-26. This means, a farmer who is rearing about 550 exotic layers for example, will have to incur about Sh119,840 a month worth of production cost, according to Subiri Obwogo, founder Kienyeji Kenya Ltd. 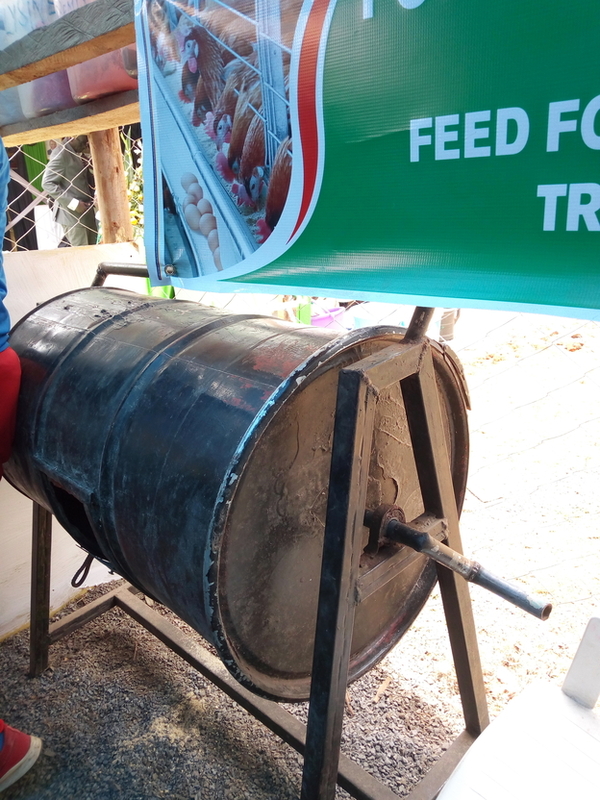 He says that provided a farmers knows the feeds mixing formula, the machine can help in making home-made feeds further recusing the cost of buying them from millers. “There’s something else farmers need to know which is that the cost of feeds alone accounts for up to 70 per cent of the total cost of producing an egg or chicken meat. This means that any effort towards reducing this cost translates to more profits for the farmer,” said Obwogo. It can mix one tonne of feeds in an hour. The machine is designed and fabricated with a view of reducing human effort and time by exploring the various principles associated with machine design. For safely and easily operation, machine was designed to carry 25kg of ingredients at once. A national platform aimed at promoting farmer-led and market based smart water solutions for improving smallholder irrigation in Kenya has been launched. The National Irrigation Acceleration Programme (NIAP) brings together stakeholders interested in smallholder irrigation in order stimulate networking and evidence based advocacy on irrigated agriculture in the country. Despite Kenya having irrigation potential of 1.342m ha, only 161, 840 ha representing 12 per cent of the potential had been brought under irrigated agriculture by 2013 according to statistics by the ministry of agriculture. The initiative which is spearheaded by the Jomo Kenyatta University of Agriculture and Technology based Water Research and Resource Centre and the not-for-profit international development organization, SNV is the first in the country to bring together relevant stakeholders at the national level. 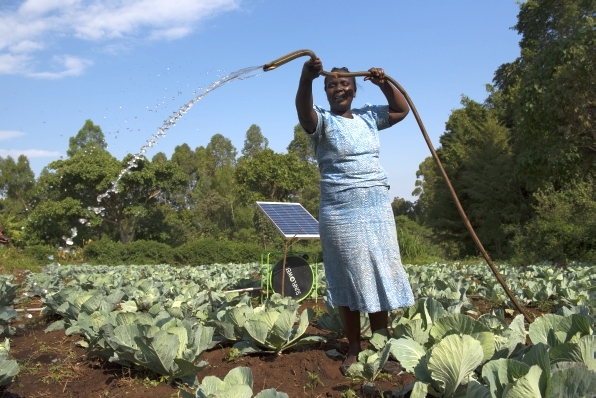 Irrigating a farm in Kenya using a solr powered water pump/courtesy. To fully develop the capacity, WARREC Director, Prof. Bancy Mati said Kenya can leverage smart solutions like harvesting and storage of surface water. The platform, she added, would be critical in advancing irrigation agenda in the country. “It will allow expert knowledge to reach farmers while ensuring that issues affecting the famers reach the decision makers, for a more harmonized and targeted intervention,” said Prof. Mati. The launch of NIAP follows successful pilots in five counties, Machakos, Nakuru, Meru, Laikipia and Uasin Gishu. The Irrigation Acceleration Programmes (IAP) in the devolved units was supported by the SNV’s Smart Water for Agriculture programme. Irrigated agriculture could significantly hoist the government’s desire to achieve food and nutritional security. Equally, without adopting innovative water solutions, the country could face 31 per cent deficit risk between water demand and supply by the year 2030. According to James Mwangi of Laikipia Wildlife Forum, the County’s IAP managed by 14-member management committee, has supported over 400 stakeholders within six clusters. Among key issues to be addressed by the NIAP are policy review, information collation and dissemination, value chain bottlenecks, coordination and capacity building.